ENVOY | Envoy partner Vizio continues to redefine the Living Room TV experience. VIZIO, Inc. announced today the retail availability of its all-new 2017 VIZIO SmartCast M-Series Ultra HD HDR XLED Plus and P-Series Ultra HD HDR XLED Pro Display collections. Powered by VIZIO’s XLED high-performance full-array local dimming backlight technology, the 2017 collections dramatically enhance on-screen content with astonishing brightness, captivating color, radiant contrast and strikingly deep black levels. Both collections perfectly pair high-performance picture quality with a robust and intuitive smart streaming experience designed with consumers in mind. Coming this summer, SmartCast TV will enable viewers to use the included remote to browse featured content directly on the big screen. For those who prefer to control their entertainment via a dual-screen user experience, SmartCast Mobile seamlessly transforms iOS and Android™ mobile devices into powerful touchscreen remotes and is now available for download. With Chromecast built-in, consumers can browse through thousands of apps they know and love on their phones before streaming to the big screen1. The all-new VIZIO SmartCast M-Series Ultra HD HDR XLED Plus and P-Series Ultra HD HDR XLED Pro Display collections can now be found nationwide both in-store and online through retailers such as Best Buy, Costco, Sam’s Club, Target and Walmart. The new M-Series and P-Series captivate audiences with added color performance, image detail and clarity that transform the viewing experience. Both collections offer enriched brightness thanks to M-Series’ XHDR Plus™ and P-Series’ XHDR Pro™ full-array local dimming technology, which enable full-white brightness performance to dramatically expand the contrast range, revealing new detail with enhanced shadows and highlights. Consumers will also appreciate High Dynamic Range performance with Dolby Vision and HDR10 content support. HDR capabilities equate to a dramatically expanded contrast range with added detail and clarity, making for a more redefined viewing experience. In addition, Ultra Color Spectrum™, now on M-Series and P-Series for 2017, reveals over one billion colors to produce richer, more vivid images, depicting every hue and tone with impeccable accuracy. Those who crave inky black levels will appreciate Xtreme Black Engine Plus™ which utilizes 32 local dimming zones in the M-Series and up to 128 in the P-Series, along with VIZIO’s advanced local dimming algorithm to dynamically adapt brightness to mimic the on-screen image. Additionally, Clear Action™ 360 and a 120Hz effective refresh rate achieved with backlight scanning in the M-Series, or Clear Action 920 and a 240Hz effective refresh rate for P-Series , ensure action-filled scenes come across smooth, stable and realistic. As members of the VIZIO SmartCast collection, every M- and P-Series display offers a robust smart streaming experience. Available this summer as an over-the-air update to 2016 SmartCast Ultra HD displays and all 2017 SmartCast models, VIZIO is bringing the SmartCast mobile experience to the big screen by making apps accessible directly from the display. The SmartCast TV home screen greets users with content recommendations and favorite apps like Crackle, Hulu, iHeartRadio, Vudu and XUMO. Users can easily browse content with their remote before launching TV shows, movies and more, directly from their display with the touch of a button. A revamped out-of-box experience and easy first-time setup helps consumers get their displays up and running using the new remote included in the box. SmartCast Mobile offers yet another way for consumers to access their favorite entertainment. By simply downloading the SmartCast Mobile iOS or Android app, users can turn their mobile devices into the ultimate touchscreen remote where they can search, browse and stream content, control playback and adjust display settings from any room in the house. Popular networks from Turner, including TNT, TBS and Cartoon Network, along with favorite apps like Fandango NOW, Hulu, iHeartRadio, Pluto TV, Vudu, XUMO and more have been integrated into VIZIO SmartCast Mobile, allowing viewers to easily browse for shows across multiple apps at once and then just tap to stream shows right to the big screen. All VIZIO SmartCast displays feature Chromecast built-in, which allows viewers to browse thousands of Chromecast-enabled apps – including 4K and HDR content from apps like Netflix and Vudu – on their mobile devices. By simply tapping the Cast button in Chromecast-enabled apps, or using voice to control their display with the Google Assistant on devices like Google Home, consumers can stream their favorite shows and movies right to their home theater display. 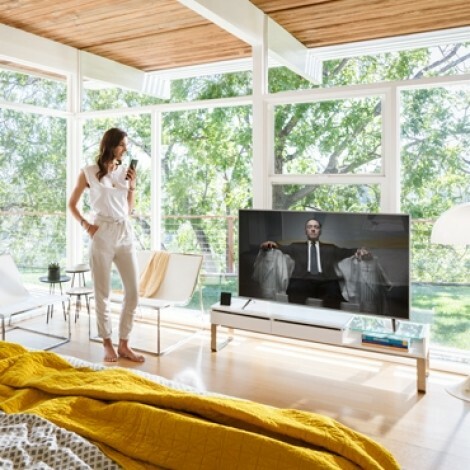 Additional convenience features like Quick Start Mode allows VIZIO users to turn on their displays automatically with a tap of the Cast button. Once users launch a Chromecast-enabled app, they can simply tap the Cast button to automatically power on their display and start streaming the selected content. VIZIO M- and P-Series displays are also compatible with Chromecast Ultra. For more information on the all-new 2017 VIZIO SmartCast M-Series Ultra HD HDR XLED Plus and P-Series Ultra HDR XLED Pro Display collections visit VIZIO.ca.